I have something to tell you that might come as a surprise to you....no two families are the same! Shocker right!?! You know that your family isn't the same as your friend's family, and their family isn't the same as yours...so you can't expect your budget to be the same as someone else's either! One of my favorite things about budgeting is that each budget is unique to each family...and that also applies to your grocery budget! I'm going to tell you why there is no such thing as a normal grocery budget. I'll share with you the 5 factors that you have to take into consideration + how to create your own "normal" grocery budget. I see this question all the time, "What's a normal grocery budget for a family of 4?". People want to know what's a normal amount for their family...and you've probably wondered the same thing. It's not that you necessarily want to fit yourself into a mold, you really just want a guideline...am I right? 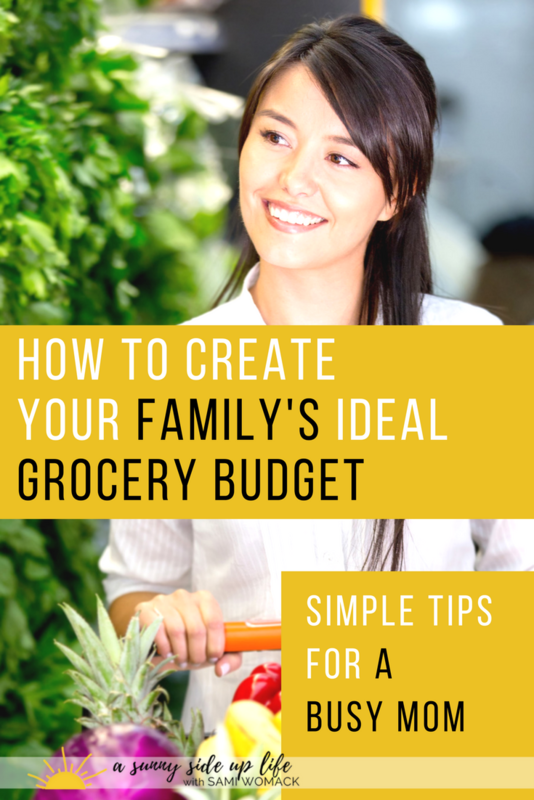 Honestly, there's no good way to ask other people what is a good grocery budget for your family because there are 5 key factors that you must take into consideration when creating a grocery budget. Do you in a big city or a small town? I live in a small town in Texas and I can guarantee you that our cost of living here so much cheaper than a bigger city like Los Angeles or New York. What country do you live in? The internet is a big place so pay attention to what country the person you're asking lives in, because various countries have various cost of living amounts. You can't take into consideration what is "normal" unless you take into consideration where you live. Take your own realty into account when you're asking these questions. Remember to take into consideration how many kids you have. Then remember that your family of 4 might consist of 2 toddlers while someone else's family of 4 could have 2 teenagers. Even with the same family size + the same ages....are your 2 toddlers both boys, both girls, one of each? Even after all of that you have to take into consideration appetite size. I have 3 girls and each of them at 1-year-old did not have the same appetite as her sisters. That's a huge factor in your grocery budget! What kind of food does your family eat? What is normal + important to your family? Are you on a Paleo diet? Are you Vegetarian? Are you a whatever-sounds-good kind of family? Are you a frozen dinners family? Locally grown? Organic only? Does someone in your family have food allergies? I hear this one a lot! Families can't eat a certain way because of an allergy + that can dramatically affect your grocery budget. Even though you might ask family size or where someone lives, you really have to take chosen diet into consideration as well. This also has to do with where you live, what you have available to you, + where you prefer to shop. Do you prefer to shop at local farmer's markets + small stores? Do you prefer to shop at big box stores like Costco or Sam's Club? What kind of stores are even available in your area? We don't have Aldi or Costco here, so I prefer to shop at Kroger. I know that Aldi doesn't do coupons, but Kroger is huge on coupons....so you have to take into consideration that my family of 5 shopping at Kroger won't have the same grocery budget as your family of 5 shopping at Aldi. It also wouldn't be the same as a family of 5 shopping at Sam's or a farmer's market. Store choice can make a huge difference in the budget! Do you just shop at one store or do you shop at multiple stores? I usually try to do about 95% of my shopping at Kroger, just because I don't like to spend the time shopping around. But maybe you like to shop around because this store has better meat + this store has better produce...you have to take that into consideration also! What's your family's situation? Does mom stay home? Does mom work? Does dad stay home? How busy are you? Do you have time to cook from scratch or are you just happy to eat? Do you have time to prep a lot or not? Like I mentioned back in #4... Do you even have time to shop around at the store that has better meat + then at another store that has better produce? Or are you like me + you just want to get to the store, get it done, + get back home because you have other things to do....even if you might spend $5-$10 more? Are you the type of person that waits to stock up on things when they go on sale? Or are you just out of paper towels + really don't care if they're on sale or not because you need them right now? Everyone's time is going to be different + it plays a huge role in your grocery budget as well. I really want you to realize that there is no such thing as normal! It's okay to ask someone else for a guideline, but realize that even if you take 2 or 3 of the factors into account you'll come to find out that every family is unique. So what I recommend, and what I did for my own family, is to establish your own family's version of a "normal" grocery budget. What you're going to want to do is to start tracking your spending. Find out what is your normal, because you might not even know. The way to do this is to simply write down + pay attention to what you're spending. Pick an amount of time, maybe a week or a month, and really keep an eye on what you're spending. At the end of the time period see how much you actually spent on your groceries. After you figure out what you've been spending, try to beat your "normal". The only person you're in competition with is yourself! All you have to do is beat your own normal! ...and if you haven't been tracking then it might be a shock to you what you've been spending. For example, say you track your spending + find out you've been spending $200 per week on groceries....and you feel like that's too much, then you're going to want to take steps to try to beat that number. How often are you going to the store? Can you shop around for a different store with better prices? How much food are you wasting? How can you plan better? Out of all of the 5 factors that I mentioned in the beginning...can you manipulate any of those in a way that could benefit you + help you create a better "normal" grocery budget for your family? Pay attention to what habits you can change. Continue to track your spending + keep challenging yourself to get that grocery budget down to where you feel comfortable. Look back at all of those factors that I mentioned + realize that your family's normal isn't going to be the same as someone else's. Maybe you're a working mom, or maybe you don't have a lot of store choices in your town, maybe you don't have time to mess with coupons or cook from scratch, maybe someone in your family has a food allergy, or maybe a specific diet is really important to your family....that's all okay! Just because you're on a budget doesn't mean you can never eat organic, or you have to cut coupons, or you have to cook from scratch....that's not the case at all! Trust me, I don't cook from scratch, I do minimal coupons, and I only shop at one store because that's what works for my family! So do what works for your family! Realize that you're only trying to beat your family's "normal"...you're only trying to do better than yourself! Track your spending + keep trying to do great things for your family! You're doing so great + I'm so proud of you! If you need help getting started with tracking your spending then I'd love to help you get started with my free 5-day free email course! Sign up + I'll send you lesson 1 right away!